Hordes is a 30mm Tabletop Miniature Wargame, the latest release from the well-known company Privateer Press (published in Germany by Ulisses-Spiele). The game is settled in a fantasy, steampunk world named "Iron Kingdoms", where also the predecessor of Hordes, the miniature game Warmachine takes place. It is a setting where beside fantasy and magic elements, also technology has its place. Nevertheless the focus here is set more on the wild countryside of the Iron Kingdoms, where Warbeasts and Warlocks of different factions try to establish their power. In Hordes you can choose one out of four different factions. 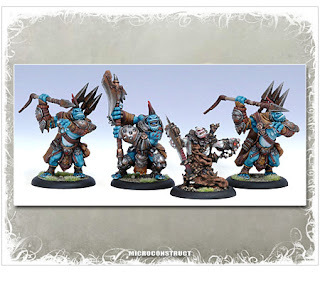 The Trollbloods are a collection of various troll breeds, and the The Circle Orboros is a collective of powerful druids. The Legion of Everblight is an army of transformed and twisted creatures, and The Skorne are a warlike race of nomads. To start with the game it is recommended to get a so-called Warpack (available for all factions, Quickstart-Rules included), which contains a couple of miniatures of one faction - definitely enough for your first battles. One miniature comes in a few tin parts, which have to be glued together and painted afterwards. Even if you are not used to this (as I am), it is great fun to assemble the figures and paint them afterwards. Believe me, the finished miniatures are really amazing and worth the efforts. In each turn (wich are taken alternating by the players) the units can be be moved and afterwards actions are carried out - actions include melee attacks and ranged attacks, but it's also possible to cast magic spells. Each miniature comes with a stat card, showing its profile and abilities (Stats for Speed, Strength, Attack, Defense, Armor and so on). Resolving of combat is rather simple as first you basically just have to compare values for Attack and Defense (including a 2d6 dice roll) and if successful (which means that the target model has been hit), you then have to add 2d6 to the Strength value of the attacker, subtract the Armor value of the Defender, and you have the damage points caused by the hit. What makes Hordes really special are the fury points, which can be used by a Warlock (who is leading the Warbeasts around him) to cast magic spells or carry out special attacks. Fury points are generated by the Warbeasts, when forced to perform special actions by the Warlocks. The rules are quite clear, although offering a lot of depth in gameplay - after your first plays you know what's going on in Hordes pretty well. Nervertheless it is necessary to deal with the specific units in detail and read carefully through their stat cards (and that's also an aspect of what makes the game so appealing), to find out about the advantages and disadvantages of the models, also in combination with the other units in your army. In my opinion also the setting and the background story of Hordes is really attractive and quite unique. Hordes is an overall great miniature game that plays fast and agressive, and which offers lots of possibilities and will guarantee exciting battles in the Iron Kingdoms. 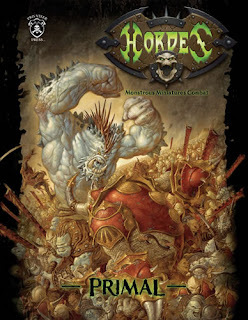 I'd really like to offer more information on Hordes in the future, maybe I will go on with an article about the basic rule book (Hordes: Primal) and afterwards with introducing some more units. Additionally I also plan to write about making (and/or buying) cool terrain for Hordes and miniature gaming in general, which is really important for creating the right atmosphere for playing. HORDES is based in the wilderness of the Iron Kingdoms, a sharp contrast to the steam-powered, man-made armies featured in WARMACHINE -- and it will launch with four all-new playable factions. The initial release will feature the resilient Trollblood, the vicious Skorne, the mysterious Circle Orboros, and the tainted Legion of Everblight.